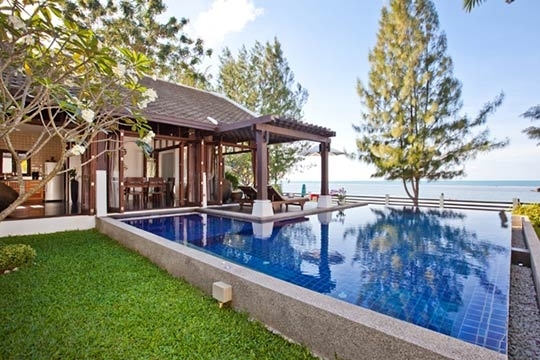 Set right on Kao Laem Noi Beach, Emerald Beach Villa 4 offers delightful panoramic views across the Thai Gulf to the famous Angthong Marine Park and surrounding islands. 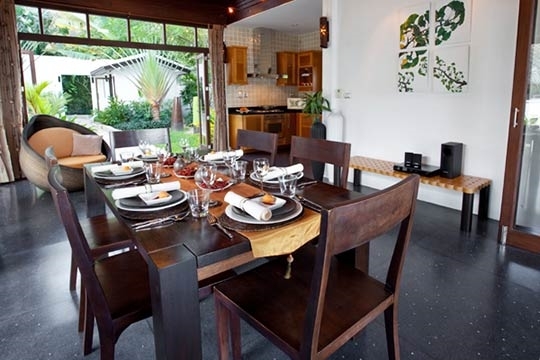 Launched in 1996, Emerald Beach Villa 4 is one of six contemporary properties in a modest beachside development, each featuring two distinct living pavilions and a private pool. The mature garden and beachside lawn promise a pleasant outdoor holiday experience, while extensive use of glass brings plenty of natural light and warmth inside. The two pavilions can best be described as day and night spaces. The former features a compact kitchen and breakfast bar with ensuite bathroom and an adjoining dining area extending into a day lounge overlooking the lawn and sea. This room opens on three sides and connects straight onto a deck and the pool for a wonderful indoor-outdoor living space. 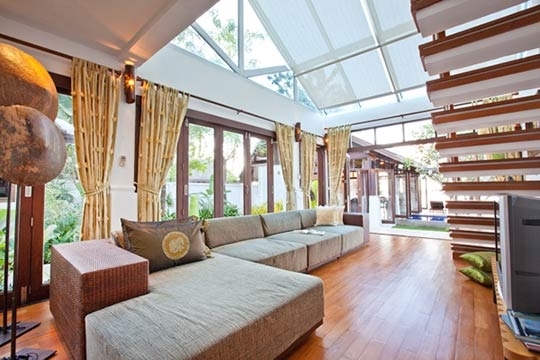 An ideal spot for lazy days while the kids explore the beach or play in the garden. 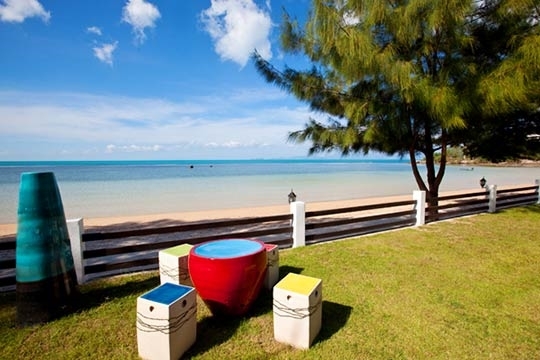 Two quirky pear-shaped chairs beckon for sundowners and the dining table can be set on the lawn for an alfresco feast of either Thai or Western meals prepared by an in-house chef (available for a reasonable additional fee). The bedrooms are housed in a two-storey, glass-topped pavilion that also features a TV lounge with new flat-screen TV (ordered but not yet installed, June 2012). Electronic ceiling blinds and air-conditioning keep the room cool, more so after dark when you can recline on the long L-shaped sofa and enjoy a movie before bed. 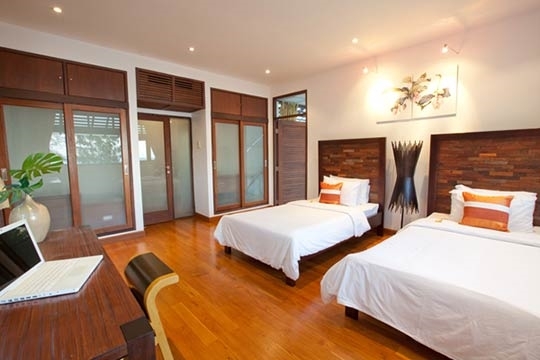 The master bedroom is spacious, with views right from the bed across the pool to the ocean. An equally generous bathroom goes beyond practical ablutions with a double jacuzzi tub. 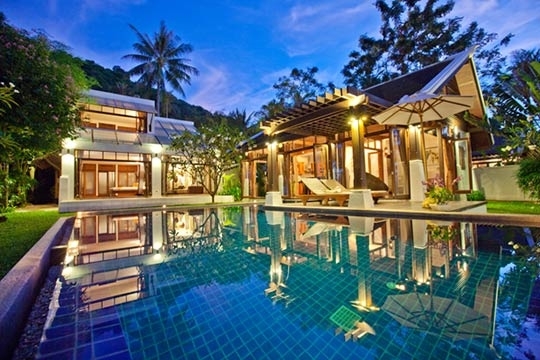 It is easy to see why this villa is popular with honeymooners. For families, the upstairs twin bedroom suits older children (seven years plus) and the combination of pool, garden and beach will keep them happy for hours. A daily maid service keeps things in order and the amenable villa manageress visits twice a day to check all is well, arrange transport or book diversions. Though it’s less than luxurious in parts and has some curious design features, you swiftly switch to holiday mode at Emerald Beach Villa. 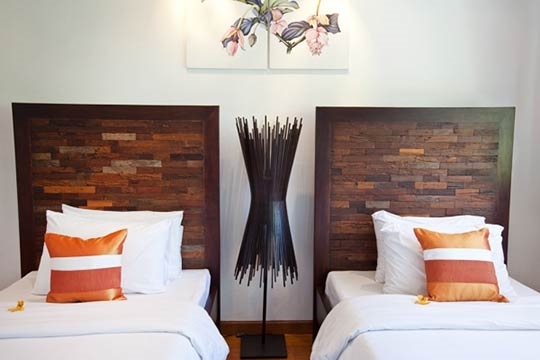 As an independent couple with plenty of travel experience, we found Emerald Beach Villa offered everything we needed on a beachside break and represented good value when compared to similar accommodation in a hotel. It would work equally well for a family. An agreeable, practical space, clearly designed for outdoor living, we spent most of our time either by the pool, on the beach or in the fan-cooled dining pavilion with the sliding doors flung open to catch the sea breeze. The rear pavilion is something of an anomaly, especially the 'greenhouse' lounge which gets very warm during the day. The bedrooms however, are spacious, cool and comfortable, although with so much glass the morning sun tends to flood in so light sleepers may find early rises become the routine. The upstairs twin bedroom is great for older kids (say seven years and above), but families with toddlers may find the steep stairs and upper landing that lead to it a concern. Renting a vehicle is highly recommended if you plan to eat out a lot, although the in-villa menu suggestions are varied if you opt to pay extra for an in-house chef. A jolly cleaner arrives every morning after breakfast and again in the evening, she's accompanied by the helpful villa manageress who deals with special requests and will even nip to the local shops to buy basic provisions. 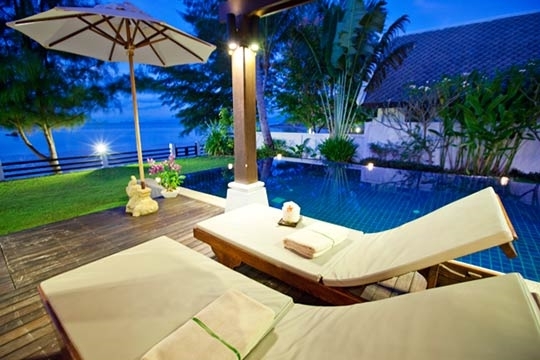 Essentially, it is the beautiful garden, quiet beach and stunning views that appeal most. The somewhat remote location makes the holiday home (villa may be a tad generous) feel your own as soon as you arrive and although the neighbours are very close by, walled grounds create a pleasant, personalised holiday environment. 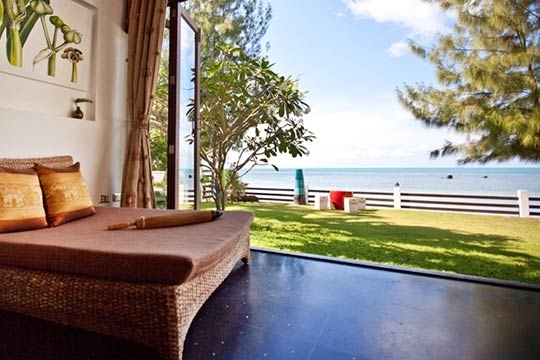 As a private alternative to Samui's more upmarket resort accommodation it is an attractive choice. Fabulous sea views, a very pleasant beach, a large lawned garden and a real sense of escape that is particularly suited to couples and small families. The L-shaped swimming pool features sunken seating with jacuzzi jets for moments of private repose. 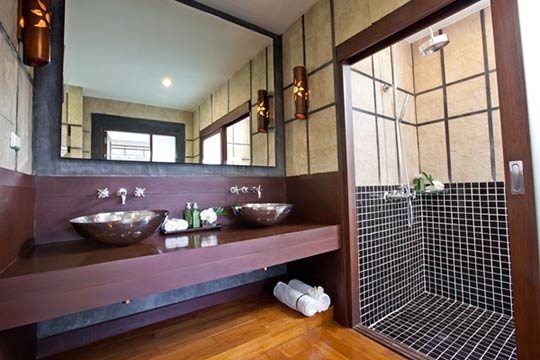 The ensuite bathrooms are suitably indulgent and, like the bedrooms, are notably spacious and well-appointed. Noise sensitive guests may not appreciate Emerald Beach Villa due to its proximity to the main island ring road. The traffic is not constant and the villas set 20m back, but the sound does feature occasionally in the background. Heat sensitive guests may also have trouble, especially during the hotter months. Only the bedrooms and TV lounge use air-conditioning and the latter still heats up in the daytime sun because of the greenhouse roof. The open doors of the living pavilion created a lovely airy feel so most people would not be troubled. Also, while the beach is beautiful and great for walking and collecting shells, the slope is so gradual that swimming, especially at low tide, is not practical – not really much of a problem since the private pool is wonderful. Kao Laem Noi is a small, quiet beach at the northernmost tip of the Samui coast. It is sandy, but with very shallow water, especially during the summer low tides from March to July when you can walk out for up to 100m and explore the rock pools. The luxurious Four Seasons Resort occupies a hidden cove around ten minutes' walk to the left of the villa, while to the right a rocky headland reaches out towards the neighbouring island of Koh Phangan. This guarantees excellent photo opportunities, especially when the local fishing boats head out in the evening light. 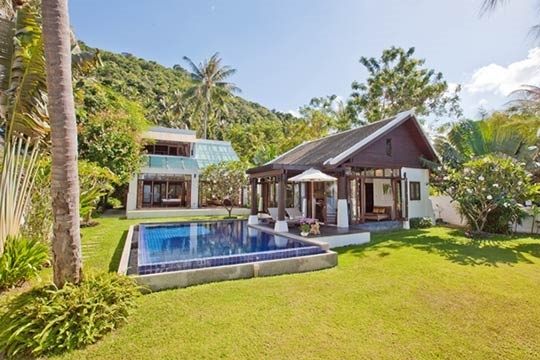 The villa development itself is remote except for a number of traditional Thai style roadside open restaurants and some more up market beach side dining offering both Thai and international cuisine dotted along the road towards Nathon and Mae Nam. 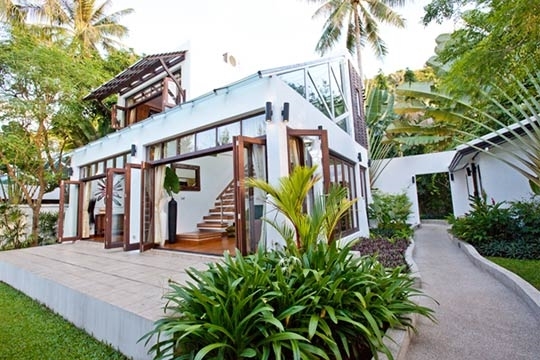 A wooden entrance setback from the roadside opens onto manicured tropical gardens and a stone-washed path that leads around the side of Emerald Beach Villa’s first pavilion. 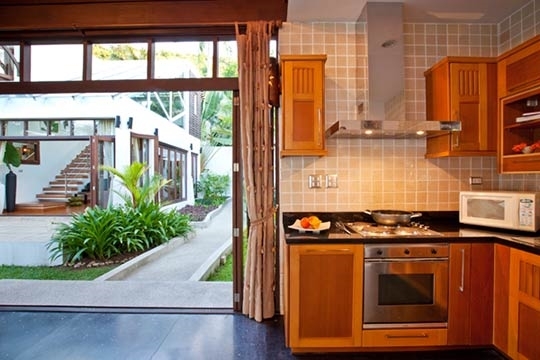 Past the manager's office, the entrance to the glass-topped TV lounge and bedroom pavilion sits to the right while the kitchen and dining pavilion lies directly ahead facing the sea. Wood and glass sliding doors surround the TV lounge, making this a bright, airy space. A long sofa spans the length of the room, facing one of the villa's two TVs, with a satellite connection and DVD player. 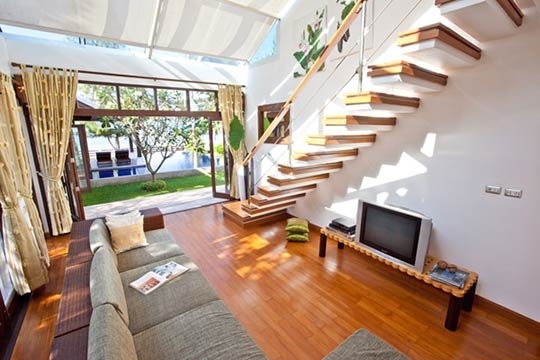 Stairs lead up to a small indoor balcony and the first floor twin bedroom. The twin is slightly smaller than the master suite below, but roomy nonetheless, with plenty of storage space thanks to built-in wardrobes. 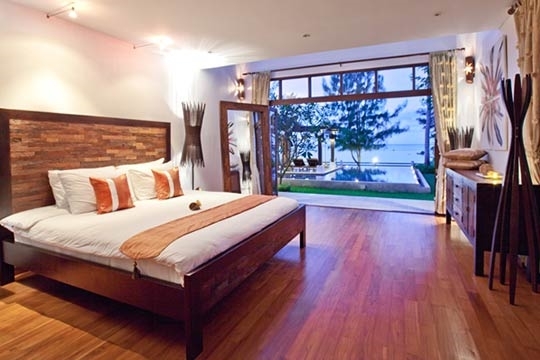 Wooden floors and furnishings add charm, while two walls of picture windows offer pleasing glimpses of the sea. The large bathroom features a central mirror and twin raised steel washbasins. 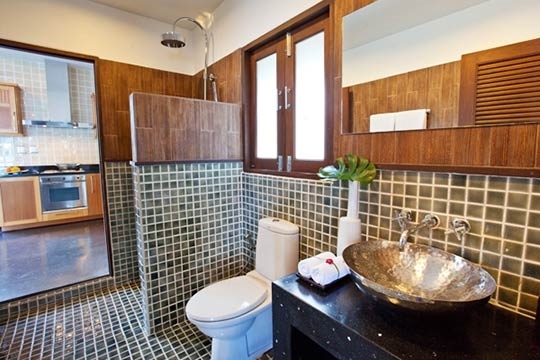 The toilet sits to the left with a large shower room right, closed off by a sliding glass door. 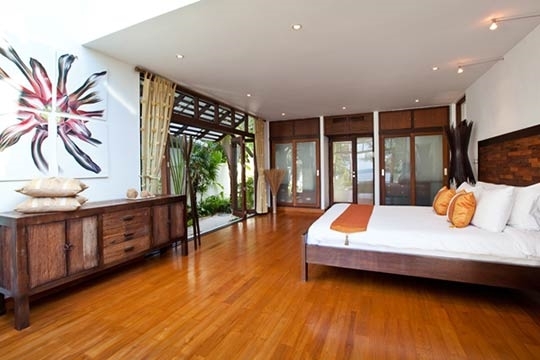 Downstairs, a door at the back of the lounge opens into an expansive double master bedroom with attractive reclaimed teakwood furnishings and sliding doors onto a terrace overlooking the lawn and pool. Subtle lighting sets the mood and there's plenty of hanging space. 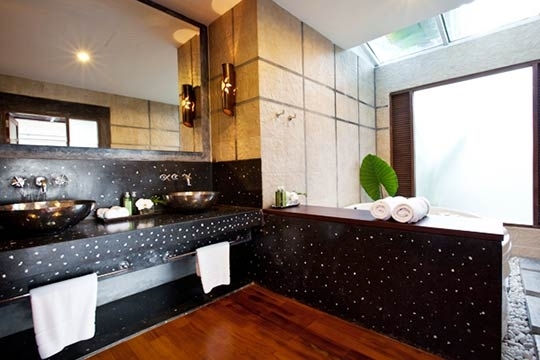 The bathroom is rather opulent with black granite surfaces and raised stone slabs leading past the jacuzzi tub to a recessed rain shower. Left of the pool, the kitchen and dining pavilion includes another ensuite bathroom, black tiled floors and sliding doors on three sides for outdoor ambiance. Cooled by sea breezes and ceiling fans, this is definitely a place to hang out during the day in your beachwear. The fully equipped kitchen is small but practical and the adjoining dining area seats six around a wooden table with oversized chairs. This leads onto a small pool deck with a comfortable, wide, swinging sofa and dreamy views down to the beach and ocean beyond. There's also a jacuzzi built into the pool for the ultimate soak and massage combination. Discounts are sometimes available for booking early (usually 4 months). For discounted rates click on the Check Availability button and enter your dates or contact Customer Service. 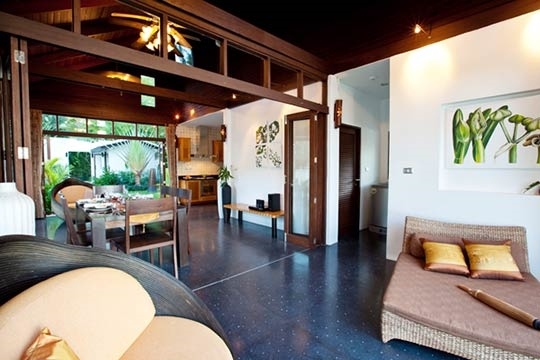 2 bedroom villa located in Bang Por-Nathon, Koh Samui. Ideal for Beachfront, Body and soul, Kid friendly, Gastronomic delights, Going for golf, Fair share for groups, The great outdoors, Romantic retreats, Sensible for seniors.